Please note: This tour runs as a combination of the Camping and the Accommodated tour. This means that there will be camping AND accommodated clients on tour. The only big difference is that campers camp at night and those who booked the accommodated tour will have a room at the lodge/ hotel for the night. Group size: On our standard group tour the number of clients is limited to 20 clients. GER: German translator available (tour is still run in English). The German translator will only be available on the last 20 days of this tour from Victoria Falls to Cape Town. From 2020, we will be doing away with the optional activity package. This is in line with the move towards becoming a more inclusive tour operator. 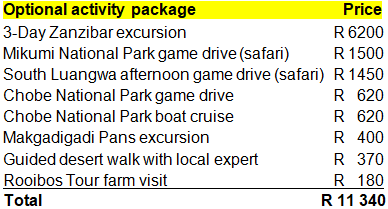 All-inclusive pricing: In 2020 we will be adding the most popular Activity Package items into the tour price meaning you will have 1 price for the tour. All meals included: All meals from start to finish will be provided. Filtered water: Clients will have access to purified drinking water on the truck for the duration of the tour. ITA: Italian translator available (tour is still run in English).